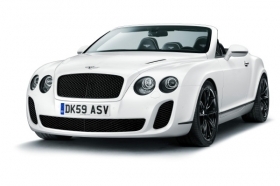 The Bentley Continental Supersports Convertible can run on biofuel. All Bentley cars in the Continental range will be sold as flex-fuel-only vehicles starting in June. Bentley announced the decision to make its Continental sedan, coupe and convertible flex-fuel at the Geneva auto show last week. It is part of the company's strategy to reduce its CO2 fleet emissions by 15 percent by 2012. The Continentals will be powered by the flex-fuel version of Bentley's 6.0-liter W-12 engine. It will be the only engine offered on the range. The engine runs on gasoline, E85 bioethanol or any mix of the two fuels from one fuel tank. The new 2011 Continental Supersports Convertible unveiled at Geneva -- the fastest open-top car the brand says it has ever produced -- is also flex-fuel. Bentley says this means that more than half of its production in 2010 will be flex-fuel compatible. Only three Bentley cars won't be flex-fuel, including the Brooklands coupe, Azure sedan and all new-Mulsanne sedan which replaced the Arnage this year, said a Bentley spokesman. Production of the Brooklands ends this year. The Mulsanne will be converted to run on ethanol in the future, he said, declining to give specific timing.